This project ended successfully on 4/11/2013 12:00! You receive the finished album as soon as we have it in our hands! You receive the finished album as soon as we have it in our hands and you can download all of the songs with a couple of extras! Use an ISNT bag to do your shopping. Before you go out with it, take out you freshly released new ISNT-album and a little thank-you note. You receive album the finished fresh off the press – and you are invited to a showcase concert in Switzerland: the Nits and guests. We will keep you posted as to who the guests are! Choose one of the songs from the following list of Nits-tracks. The cover version will be dedicated to you in the booklet of the CD which you will receive as we have it printed. The Songs: Tutti Ragazzi, Port of Amsterdam, In the Dutch mountains, Panorama man, Radio shoes, Cars & cars, Soap bubble box, Louder & louder, 26A, The flowers – first come first served! You will receive the new album plus one ticket for a showcase concert of the Nits and their guests in Switzerland. And you will get to shake hands with the musicians who happen to be backstage at said showcase. You will receive said album twice plus two tickets to the concert mentioned above – plus you will be mentioned in the booklet as a sponsor who contributed to the success of this venture. You will receive two albums and two tickets to the showcase concert and a meet and greet backstage at the concert. Choose one of the songs from the following list of Nits-tracks. The cover version will be dedicated to you in the booklet of the CD: Nescio, Adieu sweet Bahnhof, In the Dutch mountains (second version), Three sisters, Distance – first come first served! Beda or Eric will DJ for you. The choice is yours: dance music (no techno), obscure sounds from even more obscure movies, an evening of Nits-music….. whatever. You visit the studio in Zurich and see how musicians work on their song for a day. This will take place in January 2014. Henk Hofstede of the Nits visits your home and plays an intimate concert for you and your friends (maximum 40 people). Limited to Switzerland. Henk Hofstede of the Nits visits your home and plays an intimate concert for you and your friends (maximum 50 people) – but this time he takes along a friend : Büne Huber of Patent Ochsner. Limited to Switzerland. NITS are a unique band with their own musical universe. Since their beginning 1974, they have played in a huge variety of styles, with a lot of different influences. 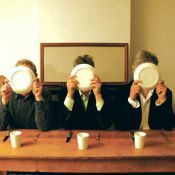 Beda Senn (Tonangeber), Eric Facon (Faze Records) and Oli Hartung (musician) celebrate the 40th birthday of the band – with a collection of surprising covers of the songs. With musicians from Switzerland and thereabouts.